December | 2008 | Two cultures, one mind. Just a quick post to let you know that I’m still here. Following on from my last post I effectively ‘closed down’ for a week, resting and trying to recover from flu/bronchitis/asthma/plague. Christmas Day was necessarily a quiet one, and I’ve not even had the energy to blog a thanks for my great presents from all my friends and family. Recovery has continued slowly, set back by a stomach bug which means I must be one of the few people to have lost weight over the festive season. New year will be a quiet celebration with friends. Meanwhile, my car is being sorted, with repairs taking longer than anticipated, but should be back with me next week. It’s the hire-car shuffle today, one hire car goes back, and another should appear shortly. There’s not much else to report. This may seem a little ‘flat’ as a posting, but it’s how I feel at the moment, until I get myself back to 100% (actually, I’d be happy with 85%) healthwise. Maybe with the new year, and all the hope that it provides, things will turn around. is a good radio programme currently being repeated on BBC7. But it also summarises the tail end of my week. After the fun of the accident on Wednesday (all getting sorted, if slowly), I had a really, really bad night with my persistent cough. An emergency appointment with the doctor yesterday (I couldn’t drive myself to surgery) led to me within the hour being admitted to New Cross hospital with suspected pneumonia. After seven hours (six of which were spent waiting around), I was discharged, with antibiotics and steroids. A night’s rest at parents and I’m back home, recovering, sleeping and still coughing a lot. Apologies to my students who were expecting to see me today, but believe me you wouldn’t have wanted to see me in my current state. I’m hoping my Christmas break will give me the chance to rest, and recover fully. As in previous years, blogging will be intermittent over the Christmas break. I wish everyone a great time, and a healthy(!) new year. The lady who ran into me has been very apologetic, but it does mean I’ll be driving a hire car over Christmas. 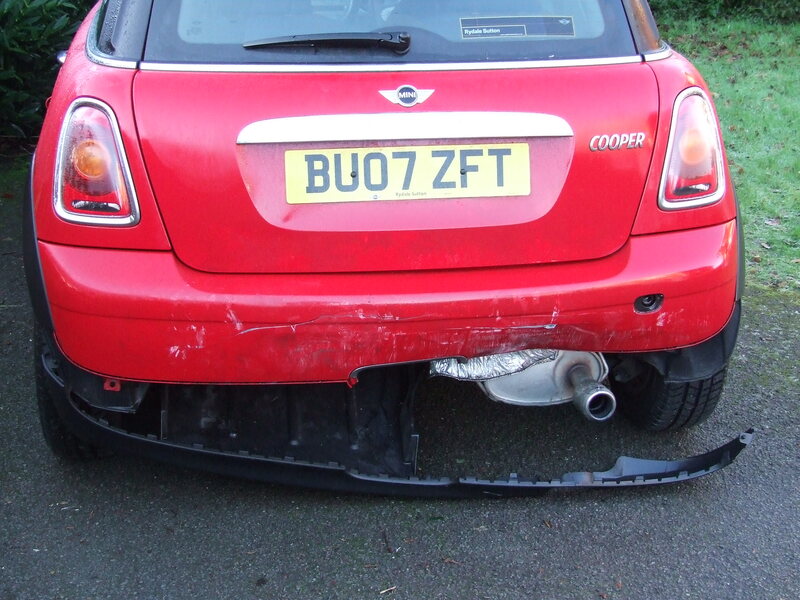 I’m OK, but as you can see bits of my car are now liberally spread around the Wolverhampton area. Apple released Leopard 10.5.6 yesterday. In the past I’ve tried to carry on working whilst the updates continued, but last night before I went to bed I tried a different tactic. The updates were 190Mb each, times two (Macbook and Big Mac), that’s a lot of data down my soggy bit of string, so I left the update running overnight. I wandered in about 4am to press ‘restart’ on both machines, and this morning all was well, and I was running with both systems updated. An alternative to this would have been to download the Apple installer, and used this for both machines, but this would have also required more ‘intervention’ on my part… and there’s a risk that something would go wrong. But if you’re a two mac household (!) there could be a more bandwidth-efficient way. This upgrade may fix a couple of problems I have, the occasional lock up in Mail, and most frustrating when Big Mac can’t recognize my wireless network when waking from sleep (putting the machine to sleep and waking up again solves this). With the increasing stability of the OS, I’m really wondering what will be new in Snow Leopard. I take ‘snaps’ more than photos, but from time to time I do take a decent pic. 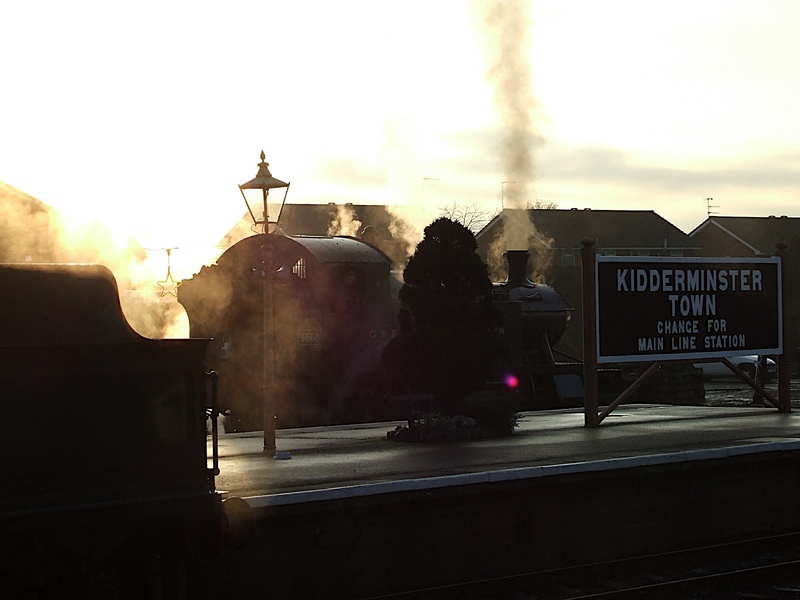 This is from the ‘Santa Special’ at the Severn Valley Railway early yesterday morning. I’m a sucker for magazines in railway stations – even if the journey is just a normal commute. Friday was no exception, so whilst ‘the cat’ was reading the rail magazines, I wandered across to the science stand, and bought a copy of the BBC Sky at Night magazine. I really bought it for the free calendar, and thought with some luck I may be able to read a couple of the movie files on the cover disc (I remember when they used to be cover tapes for my ZX81, and 5.25″ floppy discs for my Amstrad 1512, those were the days!). 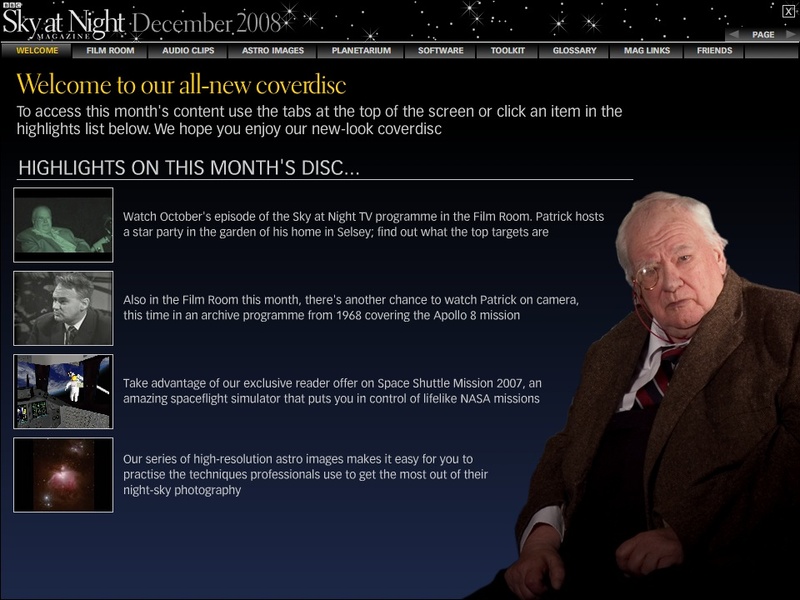 Imagine my suprise and delight (well OK, I was quietly chuffed) when I loaded it onto my mac, and found there was an application SkyAtNightmac.app – double clicking and I appear to have the full access to the CD including the commentary on the planetarium, two tv shows and a load of useful links. CD’s may seem a little ancient history in the days of broadband Internet, but I’ll be keeping the disc in my rucksack for when I’ve got my mac, but no Internet access. There’s a couple of snags – a couple of the tabs seem to cause the program to crash, but that’s almost part of the cover disc experience for me – it shouldn’t be slick and snazzy! I’ve always been a fan of using proformas to provide quick feedback to students. I’ve used them a couple of times this semester to good effect, to give students quick feedback. The problem with giving feedback in such a standard style though is that students invariably compare/contrast their marks with others, and it can be hard to justify marking within a few percentage marks. That’s what second marking/moderation is for, and I always warn students that any assessed marks are provisional. It’s clearly at the front of my mind at the moment, as I fill up my new iPod touch with applications from the iTunes (bet they wish they’d changed the name of that early on) store, but I was also intruiged to read this article on The Register. The argument put forward in the article is that App Store applications are being sold too cheap, at $0.99 (or in my case £0.59). This ‘ring tone’ price is not sustainable for many developers it is argued. But let’s look at this a little closer, and in particular the accessories which I have been perusing… Here are the apps on my two-day old iPod touch. How many of those have I paid for? Ironically, that’s the ‘Classics’ e-book one which has simply repackaged out-of-copyright texts and put a very nice e-reader package around it. And yes, I did pay just £0.59 for it. I’m not that much of a cheapskate, so why haven’t I spent a small fortune on applications, even the £0.59 ones. (I’ve just worked out that’s around 0.23% of the cost of my iPod touch). Put simply, I’ve not seen the need as a consumer. OK, I’ve focused on ‘social networking’ applications (Twitter, FaceBook, AIM and to some extent last.fm can call be regarded as social apps), and there’s a couple of fun ones there. But they’ve all been provided to me for free. I would have happily (I think) have paid a quid or two for these applications, especially after I’d had chance to evaluate them. Take last.fm. Free registration, free download, and I can pick music, playlists and do all that jazz. A much better for me to explore new music than 30 second clips from the iTunes music store. And it’s simply untrue that all applications are at the £0.59 price point. Scrolling through the Business category applications prices range from £1.99 up to £5.99 (though of course with the odd ‘ring tone’ and free application there. So someone, somewhere reckons the market will bear more. The applications store is a new market, and it will take some time to settle down. I have to admit though that I can’t see the low prices lasting for ever, maybe now’s a good time to stock up on any of the free applications that take your fancy. Remember, you don’t have to have all the applications copied to your iPhone/iPod touch at the same time, they can sit in iTunes comfortably with no hassles. I’ve always joked about people having ‘writer’s block’, the inability for a creative writer to actually put pen to paper, or more frequently now finger to keyboard. I’ve come across lots of ways of overcoming this, from proudcts such as The Writer’s Block: Ideas to Jump-start Your Imagination to simply writing anything down, and then slowly shaping this. But I’m now faced with the experience myself. I’ve given myself a target, I need to complete this piece of writing (a stage play adaptation of an earlier story) by the end of today. I’ve had this day marked out for a fortnight in my diary, and have put everything else on hold. I don’t need to go out or do anything else today except write. And here I am, two hours after starting, blogging about how I can’t start writing! It’s amazing the distractions you will find, Douglas Adams famously used to take lots of baths. For me, the tidiness of my study or work space is usually a good indicator of how much actual work I’m doing. At the moment it’s very tidy, with just my gadgets and the Writers’ and Artists’ Yearbook 2009 on my desk. (I’ve had to put my new iPod touch in a different room, too tempting a toy today). I should be thankful that I’ve got a whole day to do this, the weather is foul outside so there’s no incentive to head out,and it’s pretty well complete, though I’m not happy with some of the characterization and I need to physically put more words on the page than are there at the moment. So all I need to do is Tweet, update my Facebook status, print out the work I’ve done, and maybe another cup of tea, and I should all be ready to start… any time now.